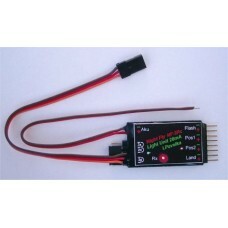 Medium size controller for 0,5 m - 1,1 m wingspan. Outputs for 20 mA LEDs: 2x Position / 1x Flashing / 1x Landing. Power 6 V-14 V. 2p3p control. NF-2 RC units are designed for illumination of the Slow and ParkFly models for flying at night. They are used to power the 3 or 5 mm color ultra bright LEDs (Light-Emitting Diode) with the nominal current of 20 mA. It contains four independent current-powered outputs. Two outputs are for position lights (Pos1, Pos2), the third output is designed to power the anti-collision flash lights (Flash), the fourth output powers the landing lights (Land). The anti-collision light flashes with one second period. The jumper contacts make possible to set the number of flashes of the anti-collision light between 1 and 3. With jumper on position "2x" or "3x" the unit produces two or three flash pulses. Without jumper, the light makes one flash pulse. The unit can be used as non-controlled or as controlled by pilot. Unit is in non-controlled mode if the Rx cable is not connected to the receiver. In this case the lights start work when the unit is connected to the accumulator and the "3p" jumper can be used to switch manually the landing lights off. If controlled by pilot, the jumper "3p" allows you to select between 2-position (Fly / Landing) and 3-position (Off / Fly / Landing) control by the remote controler. With a 2-postion control the position and anti-collision lights are always activated. However, the landing lights can be switched on and off. In the three-position control system, all lights are off in the first position (Off). In the second position the position lights and anti-collision flashing lights are on (Fly) and in the third position, all lights are on (Landing). Anti-collision and landing lights automatically begin to flash when the plane is unnable to receive a signal from the remote controler. The receiver circuit and the light circuits are galvanically separated by an opto-coupler. Unit is compatible with Graupner or Hitec-type connectors. The circuits maintain the nominal current in the wide range of voltage from 6 to 14V without the need to connect compensating resistance series in the circuit. The stabilization starts working from 4.5V, therefore it is possible to connect the unit with the used NiCd or NiMH batteries with 4 -10 cells. As the number of the cells of the powering accumulator increases, so does the number of diodes that can be connected (serially) in one circuit. Using seven-cell-accumulator, 2 green or white diodes and/or 3 red or yellow diodes can be connected in one circuit. The colors of diodes in one circuit can be combined. Its only necessary to assume that the summa of voltages of diods plus 1,8V for output circuit functionality is below the voltage of accumulator, otherwise the luminosity od LEDs falls down. The circuits are powered from the positive pole of accumulator against the common negative pole.